Here is definitely one you won’t want to miss for your little princess. It’s got and prettiest design, a cozy texture and ribbing that will look great in photo shoots and everyday life. 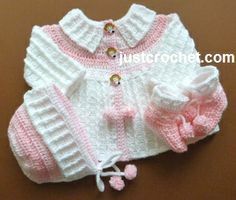 If you enjoyed this free crochet pattern you might also enjoy more designs by JustCrochet or by Patterns For Crochet.